Milk Thistle (Silybum maianum) seeds are approved in the German Commission E Monographs as a liver cleansing diet and recipe for fatty liver and inflammatory liver pain conditions. It also helps healing other liver diseases such as cirrhosis, hepatitis that are caused by alcohol and other toxins. Milk Thistle's seeds are most prized for their medicinal action where the active phytocompound Silymarin is found to be effective in improving liver health and healing fatty liver. For this reason, milk thistle is usually found in a standardized extract form with minimum 80% Silymarin. Silymarine has strong antioxidant properties because of its ability to increase GSH, or liver glutathione. Glutathione functions as a coenzyme in the body that works against oxidative damage to cells. Recent clinical research in Germany shows that the seeds of milk thistle is one the best kidney & liver detox herbs that may help to avoid liver disease symptoms and make an excellent tonic for gall bladder & kidney as well. Its basic functions include stabilizing and strengthening liver cell walls thus protecting against hepatotoxic agents (chemical that damage or poison liver cells), enhancing the regeneration of liver cells, scavenging free-radicals in the live by acting as a liver antioxidant, and inhibiting production of bad enzymes that might damage the liver while preventing the depletion of glutathione on liver cells, a substance which mediates cell metabolism. Milk Thistle 80% standardized extract is featured in Natural Assets' Formula for Liver (an herbal liver detox complex). Click here for more information. Improving liver health functions from the abuse of alcohol and environmental pollution. Reducing liver pain and other liver disease symptoms. Rejuvenate the over-worked liver and protect it from future damage. Under Evidence-based Practice Program among studies of milk thistle and chronic alcoholic liver disease, it reported significant improvement in measurement of liver function (i.e., aminotransferases, albumin, and/or malondialdehyde). One of the special qualities of milk thistle is that it would cleanse and detoxify an overburdened and stagnant liver while also being able to strengthen and tonify a weak liver; thus, delivering potent medicine to clogged, excess conditions as well as weakened, deficient condition. 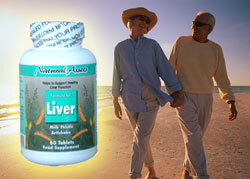 Milk Thistle extract is featured in Natural Assets' Formula for Liver. Click here for more information. Hobbs C. Milk Thistle: The Liver Herb. Capitola, CA: Botanica Press, 1992.